If you need a tasty dish with lots of pizzazz, look no further! These Grilled Chicken Lettuce Wraps are beautiful when assembled, absolutely scrumptious and so much fun to eat. There’s something so carefree (and messy!) about eating with your fingers and this is the perfect dish for you to just dig in. Grab a leaf of lettuce, add some chicken and then pile on the yummy fillings: noodles, carrots, bean sprouts, cilantro and cucumber and shallots marinated in a light vinaigrette. Lightly wrap the refreshing leaf around the hearty filling. Dip the lettuce wrap into your sauce of choice and enjoy the flavor explosion! 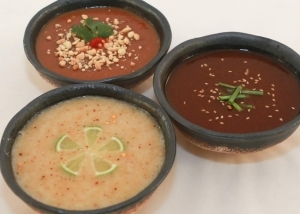 Check out my recipe for the Essential Dipping Sauces. They go wonderfully with the Grilled Chicken Lettuce Wraps. Enjoy! Cut off the core and gently peel the leaves from the butter leaf lettuce. Trim the leaves if needed. Wash the lettuce in cold water and drain well. Use a salad spinner to remove any excess water. 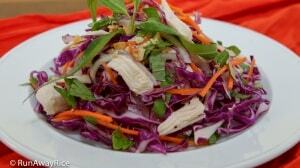 Prepare the cilantro, shredded carrots and bean sprouts in the same way. Chill in the refrigerator until ready to serve. Cut the red cabbage in half. Remove the first 3 layers of cabbage from each cabbage half, being careful not to tear through the leaves. Separate the leaves and cut each cabbage “bowl” in half to make 6 cabbage “cups”. (You will only need 5 cabbage cups and will have 1 cup leftover.) Chill in the refrigerator until ready to serve. Trim off the ends of the cucumber and then cut into thirds. Use an apple corer to remove the core. Slice the cucumber in half lengthwise and then cut into thin slices, approximately 1/8 inch thick. Peel the shallots and then thinly slice. In a medium bowl, combine the rice vinegar, water, sugar, salt and pepper. Stir until the sugar is dissolved. Add the cucumbers and shallots and toss together. Cover the bowl and refrigerate until ready to serve. Place the noodles into a large heat-proof bowl and cover with boiling water. Stir the noodles and allow to soak for 2 minutes. Drain the noodles shaking off any excess water. Spread the noodles in the colander and let air dry until it’s time to serve. Using an indoor or outdoor grill, cook the marinated chicken for 3-5 minutes on each side depending on thickness of chicken. Allow to cool slightly. Cover a large plate with the butter leaf lettuce. Place 5 red cabbage cups along the edge of the plate. Fill each cup with the cilantro, shredded carrots, bean sprouts and noodles. Fill the last cup with the marinated cucumbers. Sprinkle sesame seeds on top of the cucumbers. 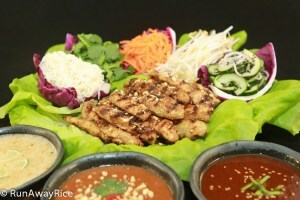 Place the grilled chicken in the center of plate and top with the crushed peanuts. 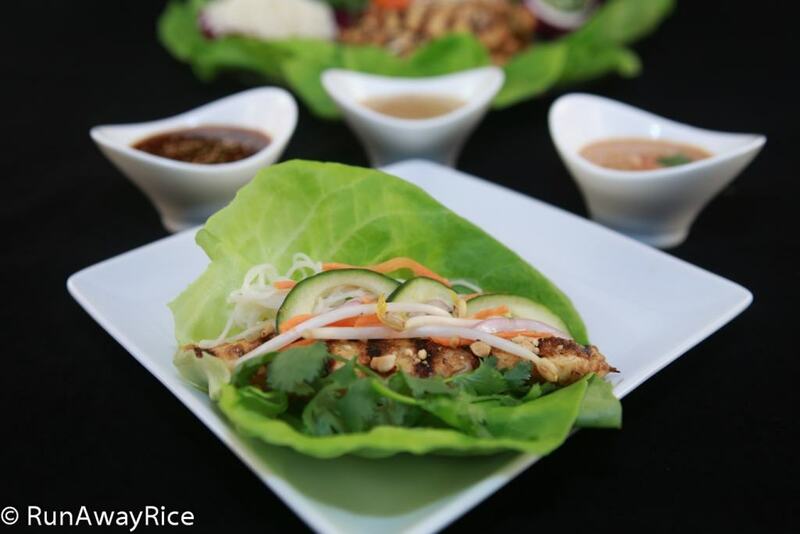 To enjoy the Grilled Chicken Lettuce Wraps, take a butter leaf lettuce, add a piece of grilled chicken and pile on your favorite fillings. Lightly wrap the lettuce around the filling and dip into your favorite sauce. Enjoy! If you need a tasty dish with lots of pizzazz, look no further! These Grilled Chicken Lettuce Wraps are beautiful when assembled, absolutely scrumptious and so much fun to eat. There's something so carefree (and messy!) about eating with your fingers and this is the perfect dish for you to just dig in. Grab a leaf of lettuce, add some chicken and then pile on the yummy fillings: noodles, carrots, bean sprouts, cilantro and cucumber and shallots marinated in a light vinaigrette. Lightly wrap the refreshing leaf around the hearty filling. Dip the lettuce wrap into your sauce of choice and enjoy the flavor explosion! Check out my recipe for the Essential Dipping Sauces. They go wonderfully with the Grilled Chicken Lettuce Wraps. Enjoy! Cut off the core and gently peel the leaves from the butter leaf lettuce. Trim the leaves if needed. Wash the lettuce in cold water and drain well. Use a salad spinner to remove any excess water. Chill in the refrigerator until ready to serve. 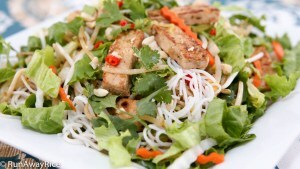 Prepare the cilantro, shredded carrots and bean sprouts in the same way. Cut the red cabbage in half. Remove the first 3 layers of cabbage from each cabbage half, being careful not to tear through the leaves. Separate the leaves and cut each cabbage "bowl" in half to make 6 cabbage "cups". (You will only need 5 cabbage cups and will have 1 cup leftover.) Chill in the refrigerator until ready to serve. Place the noodles into a large heat-proof bowl and cover with boiling water. Stir the noodles and allow to soak for 2 minutes. Drain the noodles shaking off any excess water. Spread the noodles in the colander and let air dry until it's time to serve. Refrigerate any leftovers and enjoy within 1-2 days. I loved this recipe. Very nice presentaion and just delicious. A printer friendly option would be nice. I just shared the recipe card! Enjoy!